Northey Tretheway, with the Restore Our Creek Coalition, gives outgoing EPA Regional Administrator Doug Benevento a plaque honoring his work in Butte on March 21, 2019. In Butte Thursday, the Environmental Protection Agency set a date for an important milestone in the Mining City’s Superfund cleanup. Next Friday, the agency says it will give federal court 135 days notice of filing a final consent decree laying out legally binding cleanup plans. 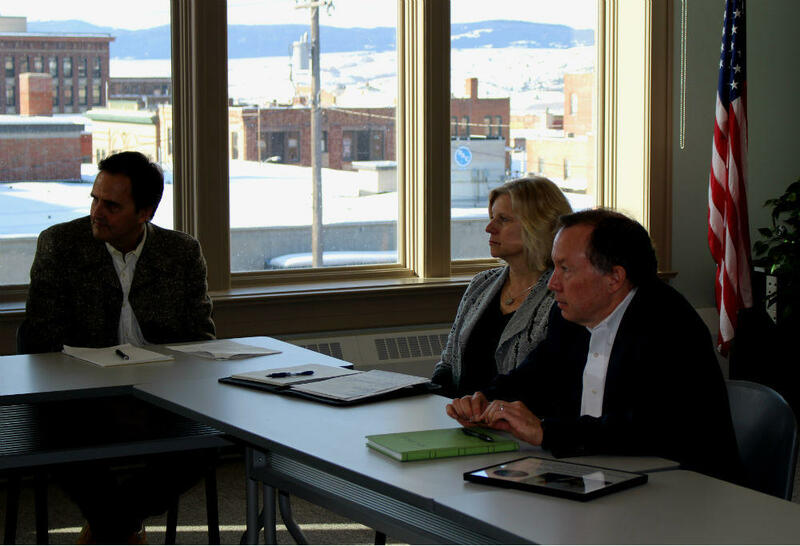 "A hundred and thirty five days is more than enough time for us to reach a final agreement, and it wouldn’t surprise me if it’s done sooner," says Doug Benevento, the EPA's regional administrator, who met with groups with an interest in Superfund cleanup at the Butte Archives. He says the final agreement in the consent decree will be a more detailed version of broad cleanup plans the EPA and other parties to the decree announced in May of 2018. "This involves the state, it involves Atlantic Richfield, it involves Butte Silver-Bow County and EPA, and it’s really important that we understand the timing of the work, and how the work is going to be done, and what goal we’re trying to achieve. So that’s really what the consent decree is all about, it’s really about organizing the final work so that we can reach the 2024 deletion date." Atlantic Richfield is the company responsible for paying for most of the cleanup. The “deletion date” is when Butte will officially be removed from the EPA’s Superfund National Priorities list, it’s been on the list since the 1980s. In broad terms, the proposed cleanup focuses on protecting Silver Bow and Blacktail Creeks. That means removing contaminated mine waste from the creek corridors, and new and improved systems for capturing and treating dirty stormwater and groundwater before they reach the creeks and the Clark Fork River downstream. The plan also calls for evaluating and capping more mine waste sites on the Butte hill. EPA's Montana Superfund Chief Joe Vranka, Assistant Regional Administrator Betsy Smidinger, and outgoing Regional Administrator Doug Benevento at the Butte Archives. March 21, 2019. But the cleanup plan does not call for reconstructing the very first portion of Silver Bow Creek where it starts its run through Butte, and instead preserves its current function as a storm drain. Longtime activist Evan Barrett is part of the Restore Our Creek Coalition, which has been pushing for the Superfund cleanup to include a re-habilitated Silver Bow Creek. "The people of Butte need to be vigilant in saying, ‘we aren’t accepting things until we see evidence that there’s going to be a creek in there when it’s all said and done.’"
Despite his criticism of Silver Bow Creek being left out of the consent decree cleanup agreement, Barrett had praise for the EPA’s Benevento, who made reaching an agreement a top priority when he was appointed regional administrator in late 2017. Earlier this month EPA announced it’s promoting Benevento, and his visit to Butte and Anaconda Thursday was in part to assure the public and the parties he’s been negotiating with that he’ll retain an oversight role on the consent decree, or CD. "Clearly he’s made a big difference in the fact that he put the pedal to the metal and forced the issue of moving forward on a CD that for 12 years was hidden behind a curtain, and did not seem to be coming forth. And he put the pressure of the EPA, saying if you don’t get it resolved as a group, we’re going to do it for you, and you may not like what we’re going to do. So, he put the pressure on, and that made a big difference. More and more people in the general public would participate, and that’s a big, big benefit." Benevento praised Atlantic Richfield for, in the negotiations he initiated, being willing to go beyond what an initial cleanup agreement called for. "I think we pushed them hard, I think they responded, and I think that I don’t know what else we could have asked them for." To accomplish the cleanup plan laid out in the consent decree means modifying the cleanup standards and plan EPA decided on in 2006. EPA says it plans to release those recommended changes to the remedy, which they are calling “the proposed plan,” for public comment in April. Benevento said that EPA retains significant power to hold Atlantic Richfield to its cleanup obligations, and that the agreement contains five-year check-ups to make sure it’s being carried out properly. Hey there loyal Richest Hill listeners, Nora Saks here. I wanted to let you know that we’re hard at work on Episode 3.
Who was Frank Little? And what could his grisly murder more than a century ago possibly have to do with Butte’s Superfund cleanup? That’s one of the questions we’ll be asking in Episode 3, which is coming at you the first week of April. Stay with us for more about Butte's past, present and future! An administrator with the Environmental Protection Agency who’s been praised by leaders in Butte and Anaconda has been promoted to become a senior advisor to the newly-confirmed head of the EPA. Doug Benevento has been a frequent visitor to Montana, and helped negotiate final cleanup agreements for Butte and Anaconda. He’ll remain based in Denver, but with a broader portfolio than just the six states he’s overseen since 2017.